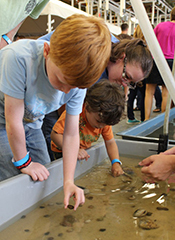 The Virginia Institute of Marine Science’s Eastern Shore Laboratory in Wachapreague welcomed an enthusiastic crowd to its campus on Saturday for this year’s Marine Life Day open house. Visitors of all ages enjoyed learning about marine research; viewing live displays of oysters, scallops, and fish native to the Eastern Shore; observing marine life under microscopes and in touch tanks; and much more. 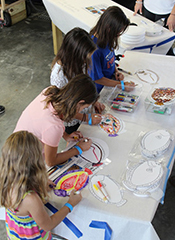 During the event, younger visitors had the opportunity to play a few games of flounder frisbee, make fish prints and rubbings, and solve an oyster puzzle. Hands-on exhibits allowed visitors to mingle with VIMS researchers while learning about restoration of Bay scallops and eelgrass in Virginia’s coastal bays, the tolerance of blue crabs to reduced oxygen, and many other topics. In addition to Marine Life Day, the VIMS Eastern Shore Lab supports a wide variety of educational activities ranging from single-day fieldtrips to multi-week classes for students from a variety of institutions. Instructors and students from William & Mary’s School of Marine Science at VIMS, as well as numerous other colleges and universities in Virginia, other states, and even other countries, use the field station for classes. For more than 20 years, researchers at VIMS Eastern Shore Lab used grant funding to support 1-2 internships for local high-school and college students each summer. As part of a privately funded initiative, VIMS has expanded this summer internship program to hire five high school and college students from Accomack and Northampton Counties each year. ESL staff also host a variety of public education activities throughout the year. Snyder says he and his staff hope to make Marine Life Day an annual tradition for the Eastern Shore. “We are very pleased with the success of this year’s event, and are looking forward to welcoming the public back to the lab very soon,” he says.